Chris Mnguni is a pioneer among a new generation of young black men zealous to plant biblical churches in the townships of South Africa. Chris is pastor of Grace Baptist Church in Daveyton township of Johannesburg. 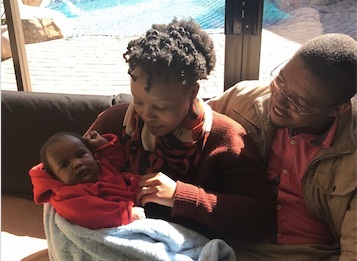 The first piece of good news is that he and his wife, Happy, have recently adopted a baby boy! 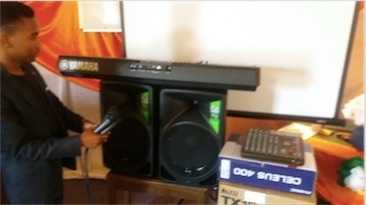 Second, thanks to the generosity of our donors, HeartCry was able to help Grace Baptist with some much-needed electronic tools - a keyboard, speakers, and a projector screen. These tools will aid the church in their regular worship meetings, and particularly in special meetings, since any time more than 50 people attend, some must sit outside their small building (thus the need for speakers). The keyboard and speakers will also be very useful in the open-air evangelistic meetings that they hold weekly.